Just weeks before Apple is rumored to launch a trio of new iPads, 12.9-inch iPad Prostock is drying up around the world. A spot check of Apple’s online store reveals that most if not all 12.9-inch iPad Pro models are now estimated to ship in 2-3 weeks in the United States, Australia, Canada, France, Germany, Japan, United Kingdom, and elsewhere—that’s up from a shipping estimate of 1-2 weeks as recently as last weekend. Apple’s in-store pickup tool lists most 12.9-inch iPad Pro models as available on March 3 to March 6 in locations ranging from New York and San Francisco to Toronto, Canada and London, England. Some models remain available for pickup as early as “today,” but stock has increasingly depleted based upon our checks. 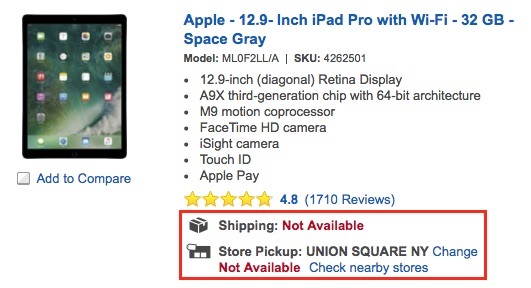 12.9-inch iPad Pro models are also largely out of stock or backordered by several weeks at resellers such as Best Buy, AT&T, and Verizon in the United States. That’s in sharp contrast to the 9.7-inch iPad Pro, which remains well stocked and available to ship immediately on both Apple’s website and at resellers. Lengthy shipping times can sometimes indicate that a product refresh is imminent, but in this case, the supply chain could be to blame. In its latest earnings call, Apple CEO Tim Cook said the company underestimated iPad demand this quarter and had an issue with one of its suppliers. Cook said he does not expect the shortage to be totally resolved this quarter, and that could reasonably explain why the 12.9-inch iPad Pro is increasingly hard to find. Apple analyst Neil Cybart of Above Avalon said Apple has been experiencing “increasingly noticeable supply chain troubles,” as evidenced by long shipping estimates on products that launched months ago, such as Apple Watch Series 2 and AirPods. 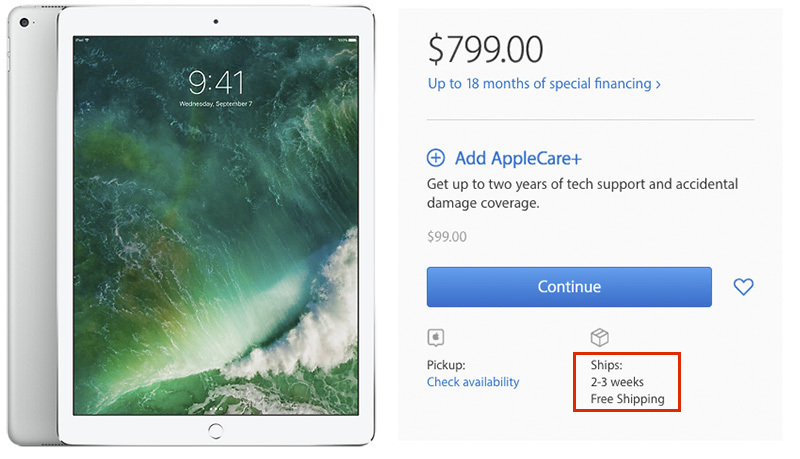 With a 2-3 week wait, the 12.9-inch iPad Pro can be added to that list. Rumors suggest Apple will launch an all-new 10.5-inch iPad Pro with slimmer bezels as early as March—or as late as the second half of this year per hit-and-miss supply chain source DigiTimes. Apple is also expected to release updated 9.7-inch and 12.9-inch iPad Pro models with faster A10X processors. Japanese blog Mac Otakara said the next-generation 12.9-inch iPad Pro will feature a True Tone display like its current 9.7-inch counterpart, using advanced four-channel ambient light sensors to automatically adapt the color and intensity of the display to match the light in the surrounding environment. The new 12.9-inch iPad Pro will also gain the 9.7-inch iPad Pro’s same 12-megapixel rear-facing iSight camera and True Tone flash, and it will allegedly still have a 3.5mm headphone jack, according to the blog. “We’ve got some exciting things coming on iPad and I’m optimistic about where things are headed,” Cook said last week. Previous PostScarsa disponibilità di iPad Pro 12.9″: nuovi modelli in arrivo?